Cranes are any of the large, long-legged, long-necked, wading birds comprising the family Guidae of the order Gruiformes. Cranes are distinguished readily in flight because they fly with necks outstretched (and stilt-like legs trailing behind), unlike the somewhat similar appearing, but unrelated herons, which fly with their necks retracted. Representatives of the Guidae family, comprising 15 extant species of cranes, occur in the wild on all the continents except Antarctica and South America. Historically, the cranes have claimed a special place in the human imagination because of their several distinctive similarities to humans, including their height, vocalization, social nature, and perennial monogamy. 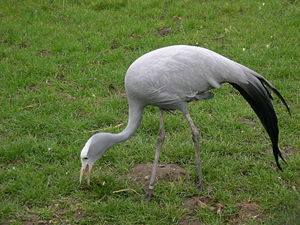 China, South Africa, and Uganda each claim a different species of crane as their national bird. In East Asia, cranes are revered as symbols of long life, happiness, marital fidelity, and love, all traits that are embodied by these distinctive birds. Pairs of cranes living in a dense breeding population, for example, and closely monitored by scientists, maintained their monogamous pair bonds in more than 80 percent of the pairs evaluated (Hayes 2005). Cranes are an integral part of the wetland and grass plains habitats they frequent. Being omnivores, they consume plants, vertebrates (such as fish, rodents, frogs, and snakes), and invertebrates (such as mollusks, insects, and crustaceans). At the same time cranes are subject to predation by such carnivores and omnivores as wild dogs, wolves, bears, raccoons, foxes, coyotes, bobcats, ravens, hawks, eagles, and especially humans. Protecting their young, cranes remain together as groups, sleeping close together at night with a few sentry birds standing guard. For human beings, the cranes' beauty, their majestic flying, and their spectacular mating dances (which may include unison calling, head thrown back, and beak upward) adds to the wonder of creation. Most species of cranes are at least threatened, if not critically endangered, within their range; habitat destruction by humans is one of the major contributing factors. The plight of the whooping cranes of North America inspired some of the first U.S. legislation to protect endangered species. Cranes have a long bill, long neck, and long legs. They belong to the Guidae family of the order Gruiformes, which also includes rails, limpkins, finfoots, and trumpeters. Although cranes appear to be similar to herons and several other long-legged wading birds with large bills in the Ardeidae family of the Ciconiiformes order, recent molecular evidence supports the taxonomic placement of cranes in the order Gruiformes. 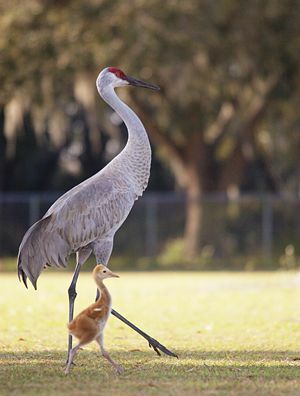 Cranes tend to be larger than herons and with a heavier bill and elevated hind toe. 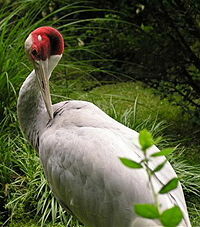 The Sarus crane, Grus antigone, found in northern Pakistan, India, Nepal, Southeast Asia, and Queensland, Australia, is the largest crane, averaging 156 centimeters. However, Indian males can attain a maximum height of approximately 200 centimeters (6.6 feet), with a wingspan of 250 centimeters (8.5 feet), making them the world's tallest living flying bird. The wattled crane, Bugeranus carunculatus, which is found in Africa south of the Sahara Desert, is the largest crane in Africa and the second tallest species of crane, reaching a height of up to 172 centimeters (six feet). The whooping crane (Grus americana), whose name comes from its whooping call, is the tallest North American crane and the only crane species found solely in North America. This species stands nearly 150 centimeters (5 feet) tall with a wingspan of 230 centimeters (7.5 feet). Cranes are found in wetlands and grass plains. They are opportunistic feeders that change their diet according to the season and their own nutrient requirements. They eat a range of items from suitably sized small rodents, fish, amphibians, and insects, to grain, berries, and plants (the cranberry is so-named for its flowers' resemblance to the neck and head of the crane). Cranes are gregarious, forming large flocks where their numbers are sufficient. When the young reach sexual maturity in the second or third year, they find their mate through a pair-bonding process that can occupy several days. The male and female "dance" and call together in an elaborate display that can include leaping high in the air with outstretched wings, tossing sticks or grass, flapping the wings, pumping the head, and bowing. Vocalizations, which accompany the dancing, reach a high point when the pair performs unison calling, an extended series of complex and coordinated calls. The pairs share in more dancing and calling while they are breeding. Once the pairs are formed most of them remain together for life, continuing to dance and call together. Some writers have been quick to discount the cranes' legendary pair-bonding fidelity based on one published scientific study of the mating stability of cranes (Hayes 2005). That study followed 69 pairs in a dense breeding population of sandhill cranes over 13 years and found 12 instances of "divorce"—and, therefore, 57 instances of stable marriages—a strong record in comparison to human marriage success rates in many countries. The study did not evaluate such other positive and widely held views of the crane as: the male and female share in the tasks of protecting and feeding the young; the male and female flank the young on either side during migration flights; the male and female dance and sing together; or the mate of a wounded or sick crane will stay with its mate even if the flock leaves for migration. Some species and/or populations of cranes migrate over long distances, while some do not migrate at all. For example, the endangered red-crowned crane, Grus japonensis, also called the Japanese crane, spends the spring and summer in Siberia, where their eggs hatch, but in the fall it migrates in flocks to Korea, Japan, China, Taiwan, and other countries in East Asia to spend the winter. All red-crowned cranes migrate, except for a flock that stays in Hokkaidō, Japan, year long. The names Grus japonensis and "Japanese crane" have become points of contention from countries, especially China, that question the fairness of including a country name in the scientific name of a highly migratory bird that spends time in several different countries. The red-crowned crane is the national bird of China. The Siberian crane, Grus leucogeranus, also known as the Siberian white crane or the snow crane, is the third rarest crane species, but it is perhaps the most critically threatened due to current threats and the lack of any projected approach for reversing the slide toward extinction. 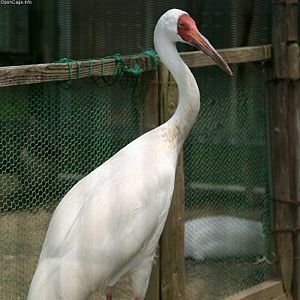 Within its territory, the Siberian crane symbolizes long life and good marriages. The total population is estimated at less than three thousand and declining. It is a strongly migratory species whose central population, which once nested in western Siberia and wintered in India, was last seen in 2002 (ICF 2007). The eastern population breeds in northeastern Siberia and winters along the Yangtze River in China, but is threatened by recent construction. The small western population winters at one site in Iran and breeds east of the Ural Mountains in Russia (ICF 2007). The red-crowned crane, with about 2,000 birds, is the second rarest crane in the world, after the whooping crane (Grus americana), which is considered endangered like the snow crane and the red-crowned crane, but its numbers (about three hundred in the wild plus about 150 in captivity) are increasing, thanks to an aggressive and comprehensive whooping crane recovery program. The whooping crane's Western population, which is the main body of the species, nests at Wood Buffalo National Park in Canada and the surrounding area, and winters at the Aransas National Wildlife Refuge in Texas. A smaller, Eastern population, established since 2001, nests in Wisconsin and winters in Florida. At one time, the range for these birds extended throughout midwestern North America. In 1941, the wild population consisted of 21 birds. The whooping crane is still one of the rarest birds in North America. 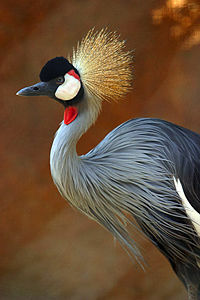 Of the 15 species of cranes, only the sandhill crane (Grus canadensis), Brolga crane (Grus rubicunda), Demoiselle crane (Anthropoides virgo), Eurasia crane or common crane (Grus grus), and gray crowned crane (Balearica regulorum) are not listed as vulnerable, endangered, or critically endangered. Among threats to cranes are habitat destruction, hunting, and illegal capture for the pet trade. Locomotion—Bipedal: The same as humans. Height—100-200 centimeters (3.3-6.5 feet): Roughly the same as for humans. There are Greek myths of cranes and pygmies fighting at the headwaters of the Nile River. Lifespan—roughly 30-40 years: About the same as for pre-industrial humans, although some Asian cultures presumed cranes lived for one thousand years and took the crane as a symbol of long life. Pair bonding—monogamous lifetime couples: An ideal for humans who in many different cultures have taken the cranes as symbols of marital fidelity and love. Socialization—live as bonded pairs and families within a larger group: Similar to human communities. Vocalization—a rich variety of sounds used apparently with specific purposes for each: Similar to human use of language. Body language—at least 90 different visual displays play a vital role in maintaining the social order: Humans' rich spoken language capabilities probably cover some of the same functions as the crane's body language. Dancing—Widely practiced by all ages and often in large groups together. Special dance procedures for courtship and breeding: A very human practice, especially in some of the more primitive cultures. Many cultures have their own crane dances mimicking the cranes' dancing, even to the extent of strapping crane feathers or crane wings on the arms. All these factors coupled with an intrinsic beauty and elegance in the crane's appearance have worked together to capture the human imagination and nurture a rich lode of symbolic associations in many cultures, with records dating back to ancient times. Crane symbolism and mythology is widely spread and can be found in areas such as the Aegean, South Arabia, China, Japan, Korea, and in the Native American cultures of North America. In Korea, a crane dance has been performed in the courtyard of the Tongdosa Temple since the Silla Dynasty (646 C.E.). In northern Hokkaidō, the women of the Ainu people, whose culture is more Siberian than Japanese, performed a crane dance that was captured in 1908 in a photograph by Arnold Genthe. In Mecca, in pre-Islamic South Arabia, the goddesses Allat, Uzza, and Manah, who were believed to be daughters of and intercessors with Allah, were called the "three exalted cranes." A crane is considered auspicious in China, Japan, Korea, and Vietnam. It is one of the symbols of longevity and is often presented in association with other symbols of long life, such as pine, bamboo, and the tortoise. A crane also is seen as a symbol of fidelity. Vietnamese people consider crane and dragon to be symbols of their culture. In feudal Japan, the crane was protected by the ruling classes and fed by the peasants. When the feudal system was abolished in the Meiji era of the nineteenth century, the protection of cranes was lost and their population plummeted. Later, with considerable effort they have been brought back from the brink of extinction. Japan has named one of its satellites tsuru (crane, the bird). Japanese school children bring their peace cranes to the Hiroshima Peace Park. According to Japanese tradition, the crane is said to live one thousand years, and if one folds one thousand origami cranes, one's wish for health will be granted. More recently, folding one thousand cranes has come to embody a wish and prayer for peace as well—since the death of Sadako Sasaki, a Japanese girl who survived the Hiroshima atomic bomb blast at age two, only to die at age 12 of radiation-induced leukemia, while she was diligently folding cranes as her prayer for peace. 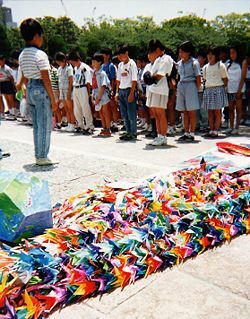 Inspired by Sadako's example, Japanese school children and later children of the world have established a tradition and movement of folding one thousand paper cranes of peace and sending them on a string to be hung in the section of the Hiroshima Peace Park devoted to Sadako and the peace cranes. Traditional Chinese "heavenly cranes" (tian-he) or "blessed cranes" (xian-he) were messengers of wisdom. Legendary Daoist sages were transported between heavenly worlds on the backs of cranes. The red-crowned crane is a common symbol of luck and fidelity. A pair of red-crowned cranes was used as a design in the D-series of 1,000 yen notes. In Ainu language, this crane is known as sarurun kamui or marsh kamui. In China, the red-crowned crane is often featured in myths and legends. In Daoism, the red-crowned crane is a symbol of longevity and immortality. In art and literature, immortals are often depicted riding on cranes. A mortal who attains immortality is similarly carried off by a crane. Reflecting this association, red-crowned cranes are called xian he, or fairy crane. 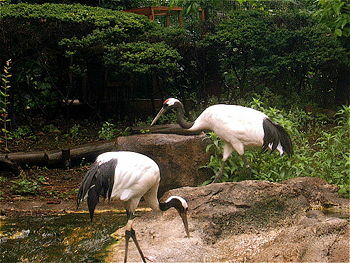 The red-crowned crane is also a symbol of nobility. Depictions of the crane have been found in Shang Dynasty tombs and Zhou Dynasty ceremonial bronzeware. A common theme in later Chinese art is the recluse scholar who cultivates bamboo and keeps cranes. Likewise, in other cultures the crane is important. The Greek for crane is Γερανος (Geranos), which gives us the Cranesbill, or hardy geranium. The crane was a bird of omen. In the tale of Ibycus and the cranes, a thief attacked Ibycus (a poet of the sixth century B.C.E.) and left him for dead. Ibycus called to a flock of passing cranes, who followed the murderer to a theater and hovered over him until, stricken with guilt, he confessed to the crime. Aristotle describes the migration of cranes in The History of Animals, adding an account of their fights with pygmies as they wintered near the source of the Nile. He describes as untruthful an account that the crane carries a touchstone inside it that can be used to test for gold when vomited up (this second story is not altogether implausible, as cranes might ingest appropriate gizzard stones in one locality and regurgitate them in a region where such stone is otherwise scarce). Also, the word "pedigree" comes from the Old French phrase, "pie de grue," which means "foot of a crane," as the pedigree diagram looks similar to the branches coming out of a crane's foot. Hayes, M. A. 2005. Divorce and extra-pair paternity as alternative mating strategies in monogamous sandhill cranes. Master’s thesis, University of South Dakota, Vermilion, S.D. Available online (PDF) from the International Crane Foundation's Library. Retrieved July 28, 2007.
International Crane Foundation (ICF). 2007. Siberian crane. Retrieved July 28, 2007. Miller, A. H., and C. G. Sibley. 1942. “A new species of crane from the Pliocene of California.” Condor 44: 126-127. Saving Cranes – International Crane Foundation. This page was last modified on 9 December 2017, at 16:08.